There’s an abundance of outdoor adventures to be had in and around Chiang Mai, Thailand. 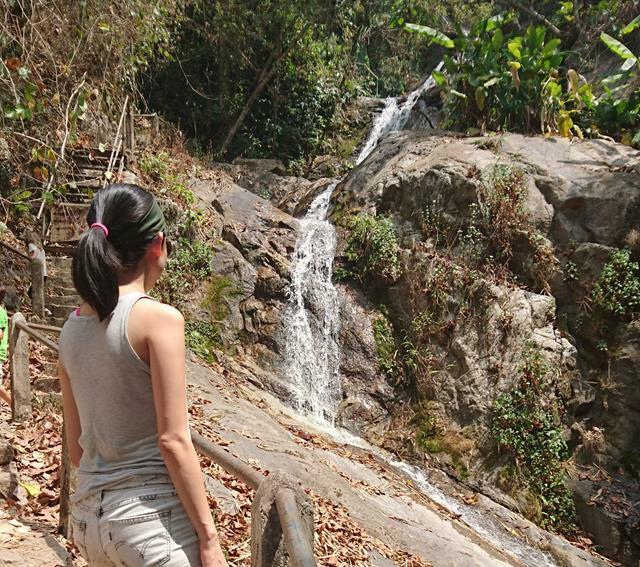 We went on a 2-day trek in Doi Inthanon (including a village homestay), and we also considered white water rafting and rock climbing, but eventually settled on ziplining. 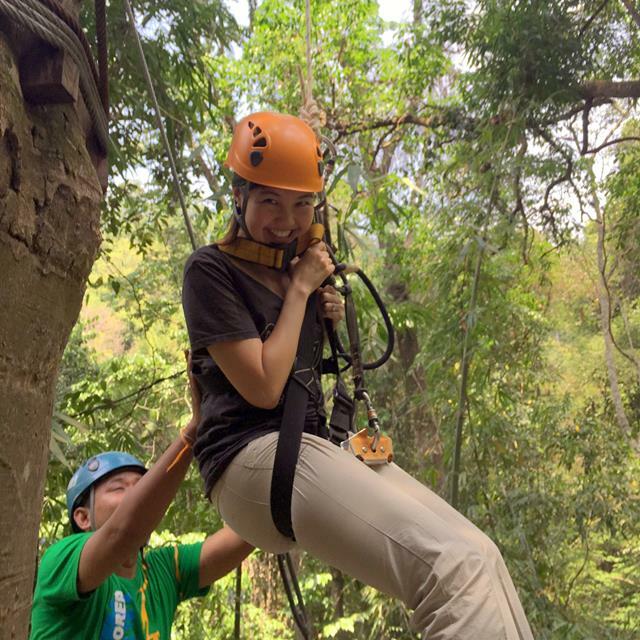 This is the story of my Chiang Mai ziplining experience. 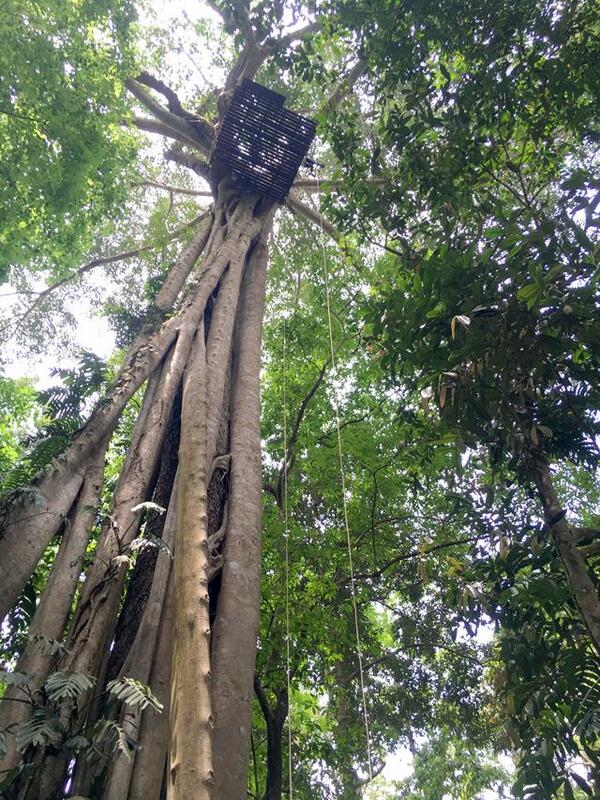 We did a zipline canopy tour with Flight of the Gibbon. It’s one of the most highly rated outdoor activities on TripAdvisor in Chiang Mai, and it’s not hard to see why. It wasn’t my first time ziplining, so I more or less knew what to expect, but I was impressed by how well-organised everything was. It practically ran like clockwork. After a while, they started spicing up the rides. After all, ziplining does get repetitive and (dare I say it?) somewhat boring after the first few ziplines. So they came up with creative ways to keep it interesting for us. I won’t reveal their secrets, but suffice it to say that I was kept sufficiently entertained! My favourite one was the “Superman Jump” – there’s no rope tension at the beginning, so it’s quite literally a leap of faith. You jump off the platform and launch yourself (Superman-style) at a big net. Once you hit the net, you have to climb to the platform where a ranger is waiting. Fun stuff! The final station was in a banyan tree, where they lowered us to the ground. Did you know that banyan trees are eventually killed by their own roots? Their aerial prop roots surround the main trunk, eventually killing it from the considerable pressure they apply on it. The trunk rots away and the dead tree eventually ends up with a hollow core. In this particular tree, you can still see the main trunk – it’s not completely enveloped by the roots yet. What a strange species, right?! A tree that slowly kills itself is just totally bizarre to me. It’s called Flight of the Gibbon for a reason! 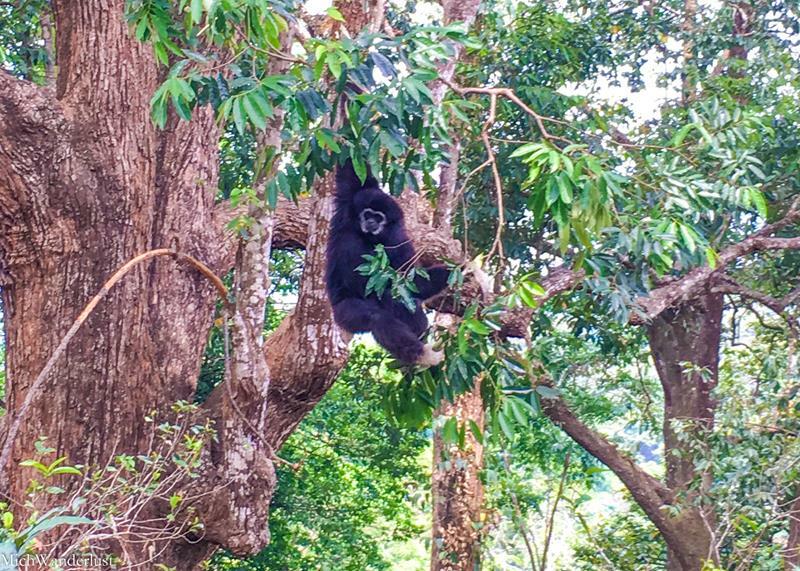 There are actually gibbons living in this forest, and you can hear them calling at times. They’ve learned to keep their distance from us weird ziplining creatures though, I think. 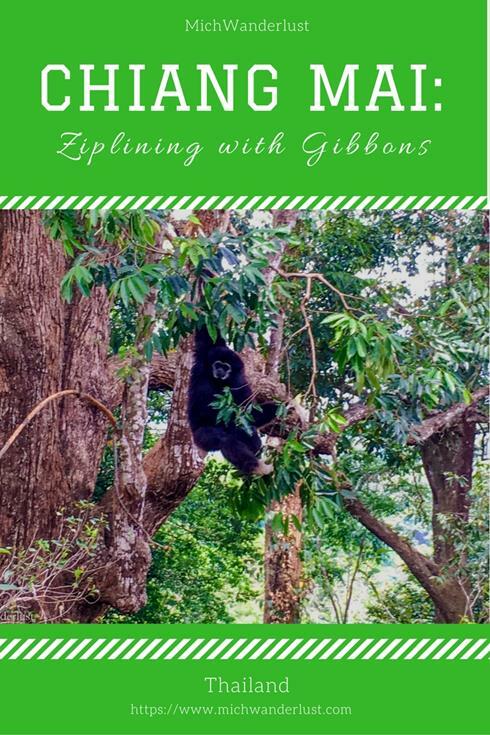 The rangers are very knowledgeable about them and can identify individual gibbons. The tour includes lunch, although you can’t choose the food you get. We had a simple Thai meal with rice and a couple of meat and vegetable dishes, including stir-fried morning glory (known as kang kong in Singapore) and papaya salad. I love both dishes, so no complaints from me! There was also a live band playing traditional music while we ate. They weren’t bad, but I felt sorry for them because nobody was paying them any attention. The tour also includes a visit to a nearby waterfall. By this time, however, we had practically lost count of the number of waterfalls we’d seen in the last few days (during our Doi Inthanon trek), so we focused on trying to find the most Instagram-worthy shot (like the one above). I don’t think I’ll ever get sick of waterfalls, but they definitely lose some magic when you see so many in such a short period. The tour costs THB3,999 (SGD160 / USD120) per person. The ziplining part is about two hours, and you’re back in your hotel by mid-afternoon. Personally, I think it was good fun, but I wouldn’t do it again at that price. Ziplining gets progressively less thrilling for me the more I do it. It’s the same with roller coasters, which is why I no longer actively seek out theme parks when I travel. This is in stark contrast to diving, for example, or even obstacle courses like the UK’s Aerial Extreme. Perhaps it’s because you actually have to do quite a bit of work, instead of being passively taken along for the ride. This gives a whole new meaning to the old saying “no pain, no gain”! Wear zip pockets if you want to bring a camera. You can also rent a GoPro from them. Put on some bug spray. Have you ever gone ziplining? How did you like it? Exciting news! I’m so honoured to have had some of my travel tips featured on GoEuro! Check out tips for planning your Europe trip here (including tips on booking flights, planning itineraries, budgeting tips and transport hacks). You can also see my tips in How to Plan a Europe Trip in 10 Easy Steps, and How to Find Cheap Flights to Europe. Many of the tips are applicable not just to Europe but other trips in general, and I always enjoy reading other people’s travel tips :). This post is part of The Weekly Postcard hosted by As We Saw It, Travel Notes & Beyond, A Hole in My Shoe, Selim Family Raasta and Eff It, I’m on Holiday – check out what’s going on elsewhere! Oh no, I hope it didn’t affect your enjoyment of the experience too much! Some might call me paranoid but one can never be too careful about mosquito bites, I think. I do like ziplining. My boyfriend is afraid of heights and didn’t like a Superman drop one we did before- he would not like that! It is funny when you see so much beauty – like waterfalls – that is gets less exciting. Not a bad problem to have! 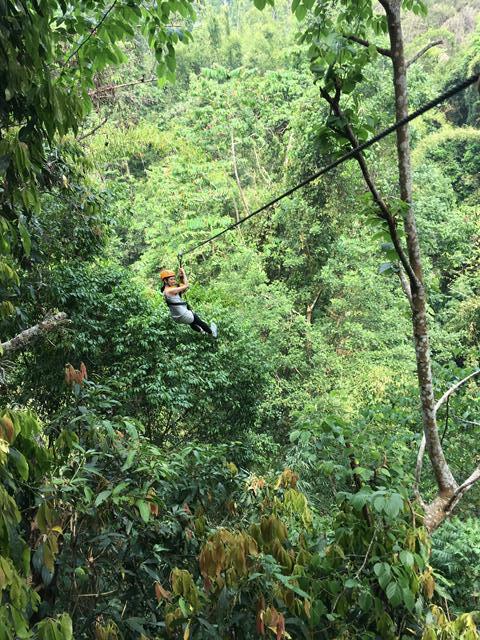 I think ziplining in general would be nerve-wrecking for people who are scared of heights – your boyfriend was very brave to go at all, i reckon! Waterfall overdose is definitely not a bad problem to have, haha. Thanks for stopping by, Cathy! I have only done a “baby” zipline and that was enough for me! I think it is nice that they change up the ziplines and you can see gibbons though. We had one or two girls who were terrified at the beginning but after the 10th one they were pretty chill about it, haha. Just something to keep in mind if you ever feel inclined to try again, Anisa =) it was very nice to see the gibbons indeed! Well…I’ve been diving and I’ve been ziplining. I have to say that I agree with you: Diving never gets old, but treetops all begin to look alike after a while. I nearly choked when I saw how much they charged for the experience. From this side it doesn’t look like they gave you SGD160 worth of fun. How does the price compare to a dive in that region? Thanks for sharing this story on #TheWeeklyPostcard. Thanks for stopping by, Linda! Diving around here is about SGD100-200 a day – it varies quite widely but yeah the price is comparable i think! Ziplining in Fiji is even more expensive, as i recall it cost about SGD250! Sorry that was 245FJD which is about SGD160 as well! I’ve never tried ziplining or diving for the matter. Both these sports look kind of scary to me, but I have to say it must be quite thrilling to see the tree tops in the jungle. I admit I’m a bit of an adrenaline junkie, so this kinda thing is exactly what i love. It’s very thrilling indeed, although i spend most of my time focusing on nailing the landing (i.e. not bowling anyone over). Thanks for stopping by, Anda! Thank you so much. I definitely would want to go zip lining there too! Looks awesome & fun.